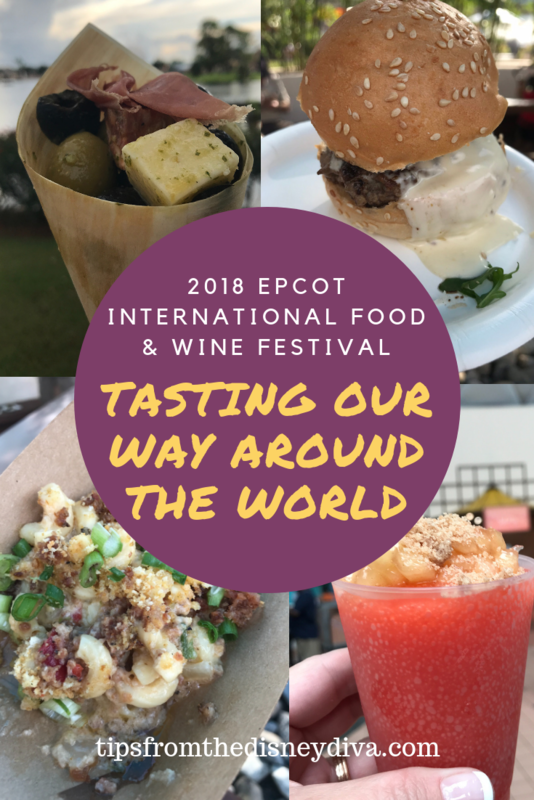 One of the most popular festivals of the year at Epcot just opened, and although we only had a few hours to spend at the 2018 Epcot International Food & Wine Festival, we were able to sample several of the snacks offered this year. 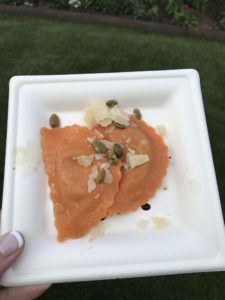 With so many booths, and even more scrumptious choices, it was difficult to choose what to sample. We wanted to try them all! (Well, almost all.) But with only one afternoon, we had to be selective. There certainly are more we’d love to taste. We began at the Festival Center at the Shimmering Sips Mimosa Bar. 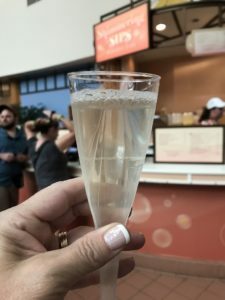 I had the arduous task of choosing among the enticing flavors of mimosas to try – Blood Orange, Tropical, Madras, Frozen, or Key Lime. I wish they had offered a Mimosa Flight! I settled on Key Lime, and in retrospect wish I had made a different choice. Although it was light and refreshing, it didn’t really have any of the tangy lime flavor I anticipated. We also sampled the non-alcoholic Frozen Apple Pie. The apples on top were tasty, definitely reminiscent of apple pie, but the frozen slushie itself had little apple flavor – almost more of a cherry taste. Still, it was yummy! Next, we headed over to Taste Track to sample a specialty croissant doughnut. I am a HUGE fan of the croissant doughnuts served year-round at the Refreshment Port, and given I am also a HUGE chocolate and hazelnut fan, I was anxious to try the Croissant Doughnut with Chocolate Hazelnut Cream. I was expecting a blend of Nutella and croissant doughnut, but that’s not what this snack turned out to be. 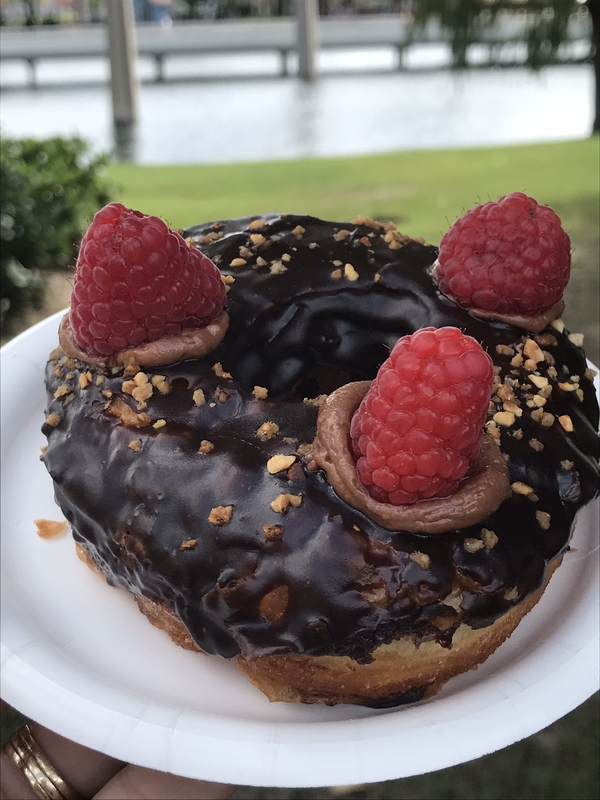 Instead, it is a chocolate frosted croissant doughnut with 3 dabs of chocolate mousse topped with raspberries and small, crunchy bits of what I presumed to be hazelnuts. I was a little disappointed, and my disappointment sank to shear sadness when I took a bite and found the croissant to be rather tough and chewy. Definitely can’t recommend this one. Not to be discouraged, we headed to Flavors from Fire. 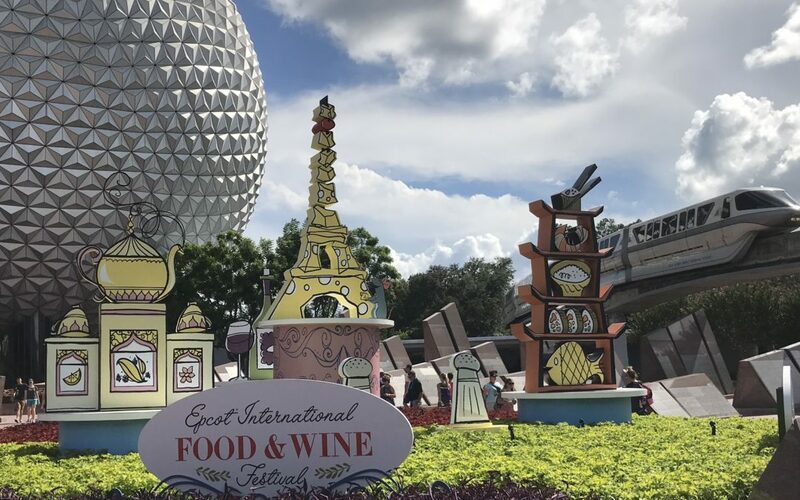 Diva Tip: The Festival Passport describes this as being located near Epcot Character Spot, but we had some trouble finding it. If you head to the Character Spot, it’s outside the building, but on the side nearer to World Showcase. Here, we were ready for something more protein-based and decided to taste the Smoked Corn Beef. This was delicious!! It’s served on a bed of warm, crispy potato slices with pickled onions, Blonde-Ale Beer Fondue and Romano and American Grana cheeses. The potato slices were perfectly crisp, and the sauce was a wonderful accompaniment (and I’m not a beer drinker). The corned beef was tasty, and not as salty as it typically can be. 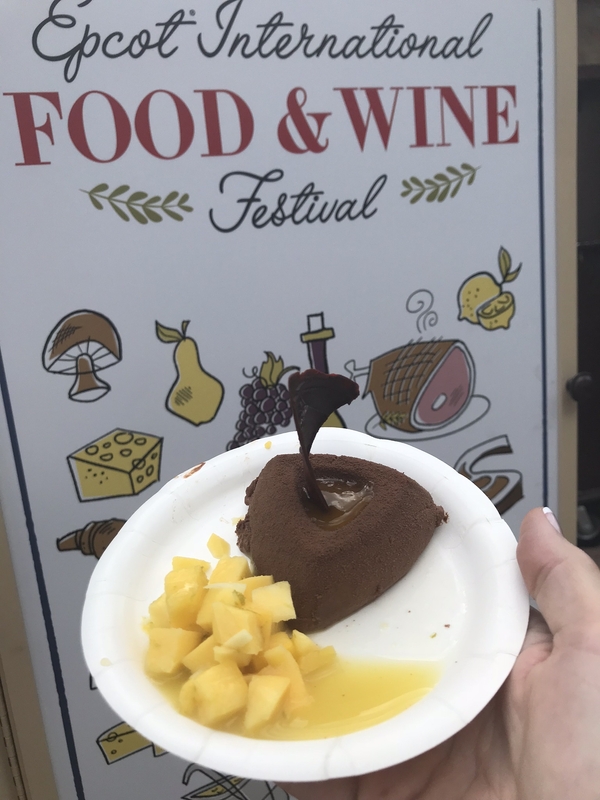 And since I’m a chocolate junky, while we were at Flavors from Fire I had to try the Chocolate Picante – dark chocolate mousse with cayenne pepper, paprika, and mango. It was so rich and flavorful. The mousse had that wonderful dark chocolate fullness, and the cayenne really added a kick to the flavor. Paired with the sweet mango, it was a near perfect combination. 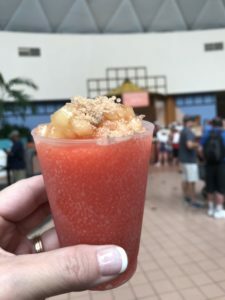 Right next to Flavors of Fire is Earth Eats, Active Eats, and Coastal Eats. 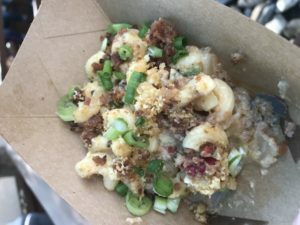 We sampled the Steakhouse Blended Burger from Earth Eats and the Loaded Mac ‘n’ Cheese from Active Eats. 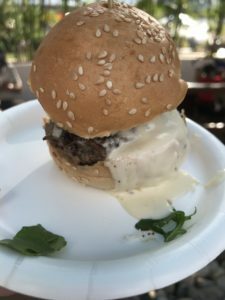 The Steakhouse Blended Burger is a blended beef and wild mushroom slider with Brie cheese fondue, arugula, and a truffle and blue cheese potato chip on top, served on a brioche bun. We thought the meat was very tasty – juicy, flavorful and well prepared. The brie fondue was a wonderful addition to keep the slider from being too dry. The Loaded Mac ‘n’ Cheese from Active Eats is loaded with Nueske’s Pepper Bacon, cheddar cheese, peppers and green onions. We thought it was a little too loaded with green onions, and had to scrape off a fair amount of them. Hopefully this was just a fluke, because the mac ‘n’ cheese itself was wonderful. Since I’ve already professed my addiction to chocolate, it should be no surprise that a booth called “The Chocolate Studio” would demand my attention. 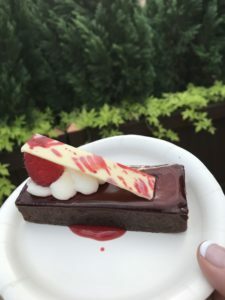 You’ll find this little slice of chocolate heaven located on the pathway to the far right as you walk from Future World West to World Showcase. I tried the Sweet Dark Chocolate Raspberry Torte with whipped cream, and it certainly met with my approval. It was everything dark chocolate should be – a little bitter and extremely rich – with the perfect complement of raspberry and whipped cream. A definite winner! 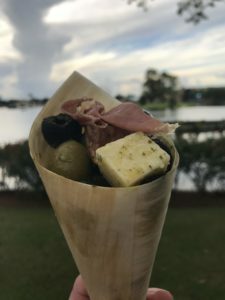 Our next stop was at The Wine and Dine Studio, just a little further along the pathway to World Showcase. 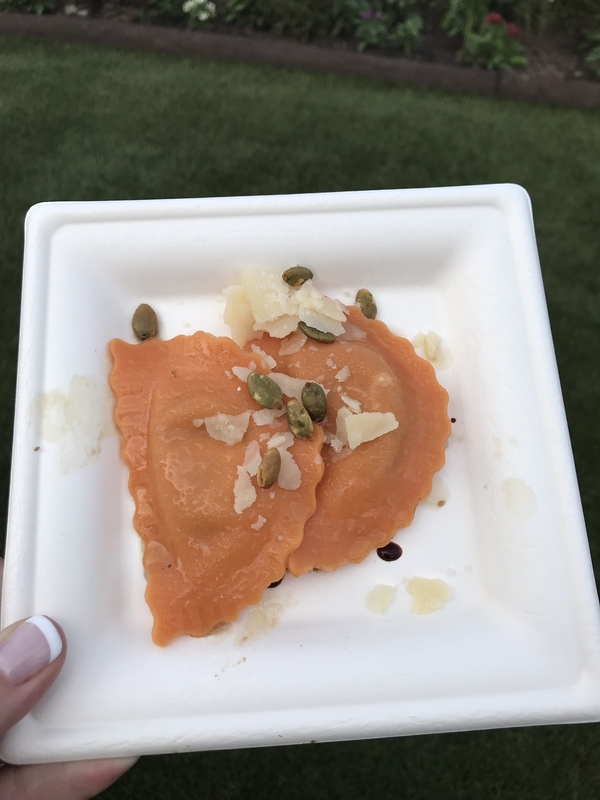 Here we decided to sample the Butternut Squash Ravioli, served with brown butter vinaigrette, parmesan cheese, and pumpkin seeds. The pasta was cooked to just the right firmness – we were able to cut it with our fork, yet it wasn’t mushy. The brown butter vinaigrette had a little sweetness to it, and when combined with the savory squash made this a truly appetizing dish. By now we were feeling quite full, and so as we entered World Showcase we knew we would have to bypass a few of the booths that had been on our list to try while we waited for our appetites to return. We strolled past Mexico, Norway, China, and Germany, but finally stopped for another bite at Spain. I had really wanted to try the Charcuterie in a Cone here, and I’m glad I did! The selection of green and black olives, along with cheese, was extremely tasty. There were two kinds of meat – one thinly sliced and the other a denser, course cubed meat. 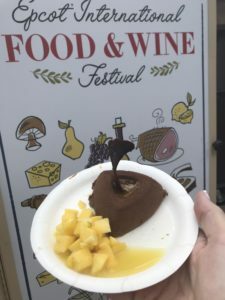 I wish I had asked what specifically they were, as it’s not listed in the Festival Passport, but both were delicious! My final stop was Hops and Barley at The American Adventure. Even though my stomach was saying “ENOUGH!” I had to have a New England Lobster Roll. Living in the Midwest, I never have much of an opportunity to enjoy lobster rolls, and I really do enjoy them! So I couldn’t pass this up. 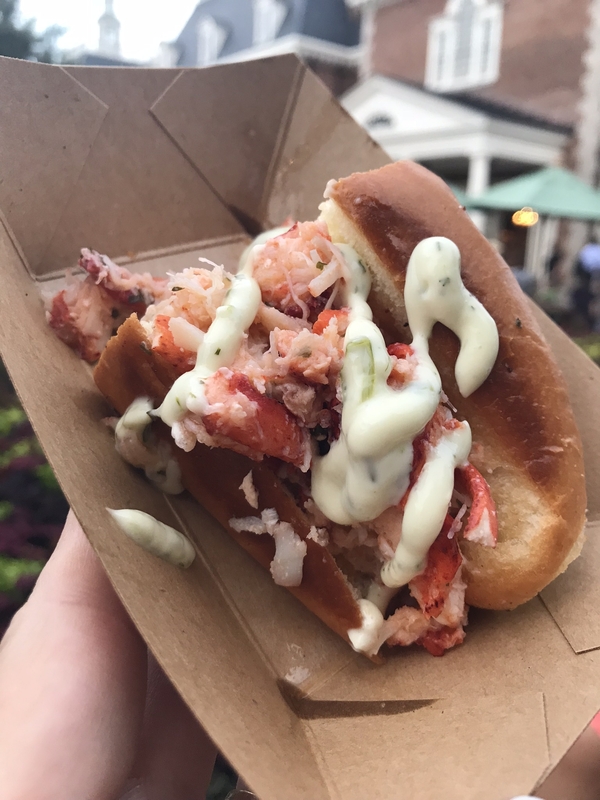 It was as delectable as I had hoped – large pieces of lobster without too much mayonnaise. The roll was fresh, soft, and warm. It was fabulous. There were so many snacks we just couldn’t try. 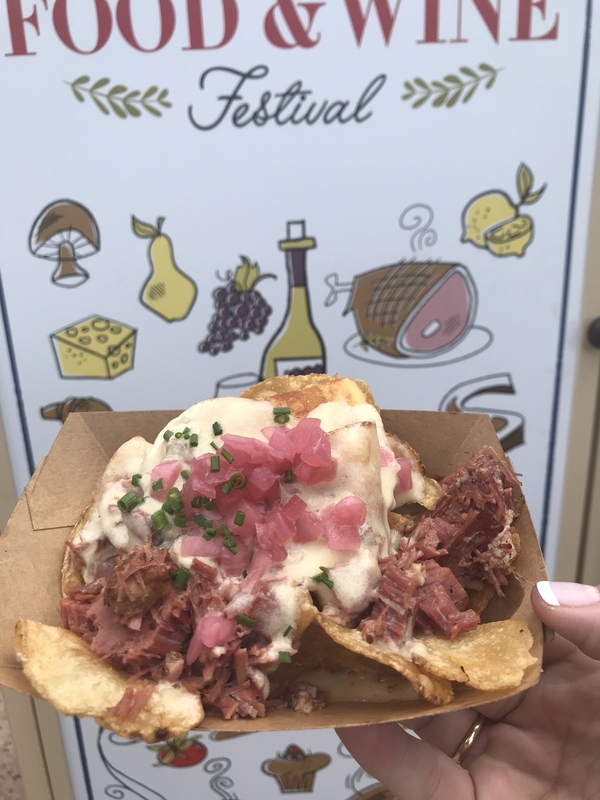 The Maple Bacon Funnel Cake, the Belgian Waffle with Warm Chocolate Ganache, Warm Irish Cheddar Cheese and Stout Dip, Canadian Cheddar Cheese and Bacon Soup, the Artist Palette of Wine and Cheese, Loaded Greek Nachos – the list goes on and on. With over 40 destinations, you certainly could spend much, much more than a few hours tasting your way around the world. If you’re ready to see how many snacks you can taste, be sure to contact Patricia at All for Dreams Travel. 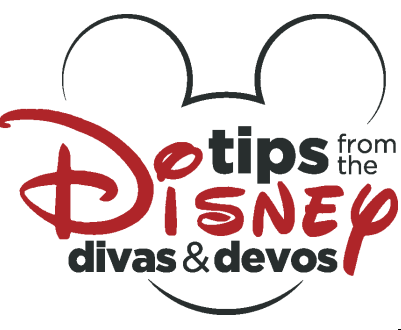 She can book your trip, make your dining and FastPass+ reservations, and answer all your travel questions. You just need to be sure to bring your appetite!